The Laterum Conference and Wellness Hotel ***/**** is located in Pécs, in the European Capital of Culture 2010. Hotel Laterum is a four-and three-star hotel with a capacity of 220. We offer you the service of our excellent RESTAURANT, our first-class conference room and WELLNESS facilities. The use of WELLNESS facilities, the BUFFET BREAKFAST and VAT are INCLUDED in the price. The hotel has been running successfully for 20 years as a family business. All renovated and comfortable double-, triple and four-bedded rooms are equipped with bathroom (with shower), colour television (with satellite channels), refrigerator and hair dryer. 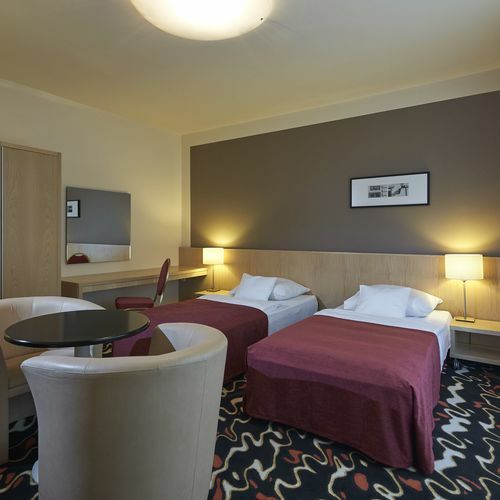 Non-smoking rooms and rooms for disabled are available. Our hotel is located in the western part of Pecs. It is easy to get to the hotel by public transportation as well as by car. The historic inner city of Pécs can be reached easily from the hotel. Parking place is available free of charge. The services of the WELLNESS unit, the BUFFET BREAKFAST and VAT are INCLUDED in the price. Our guests can choose from various excellent, traditional Hungarian specialties and international dishes. We provide a wide range of menus, service of high standard and fair prices. National and international conferences, business meetings, weddings and banquets can be held in our prestigious rooms. The rating of Hotel Laterum Pécs is 8.7 from the maximum 10, 352 based on actual and valid guest ratings and reviews.